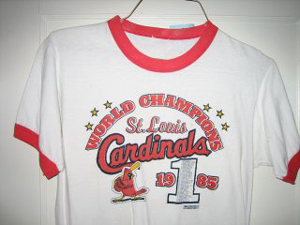 After reading our championship merchandise for teams who didn't actually win the championship post from a couple of days ago, a blogger named Steve Simonsen dug through his closet and came up with the most gruesome of possible finds: A T-shirt celebrating the St. Louis Cardinals' World Championship in 1985. But looking at that shirt is like looking at a invitation for a wedding that never happened, or a fantasy NBA roster with Hank Gathers and Len Bias, or, say, a 2001 Cleveland Browns Super Bowl Champion hat. Just heartbreaking to even think about it. Simonsen needs to burn that shirt, and fast.